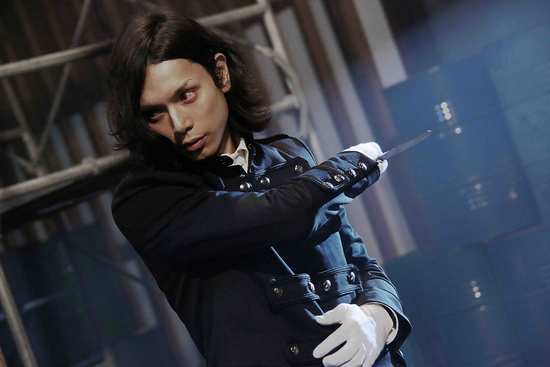 Hiro Mizushima of “BECK” (2010), portrays the perfect, but arrogant, demonic butler, Sebastian, in this stylish action film directed by Kentaro Otani of the “NANA” series, and Keiichi Sato of “Asura” (2012). Kiyoharu is the young head of the Genpo noble family, owners of a massive toy manufacturing enterprise. He also functions as a secret watchdog for the Queen, a service that his family has provided for generations. The Queen orders Kiyoharu to solve the mummification incidents, and he starts to investigate. He is supported by his perfect butler, Sebastian, who is actually a demon. Kiyoharu has been hiding his true female identity since his parents’ tragic death 10 years earlier. In return for perfect service to his master in public and private, Sebastian will receive his master’s soul after Kiyoharu achieves revenge for the murder of his parents. Who is really behind the serial mummification deaths? Will Kiyoharu finally find out who killed his/her parents? Black Butler (cert.15) opens in UK cinemas on 17th October 2014, courtesy of Warner. Bros UK. The original comic “Black Butler” was written and illustrated by Yana Toboso, being serialized in the monthly G-Fantasy, published by Square Enix. Since the start of the comic in 2006, the series has been very popular and has sold 19 million copies worldwide. It has been translated into over 20 languages, and sold in 42 countries and territories.